Come learn more about Jesuit life and discern where God is calling you to go. The Jesuit Vocations Ministry has some upcoming events for those looking to discern their vocation. 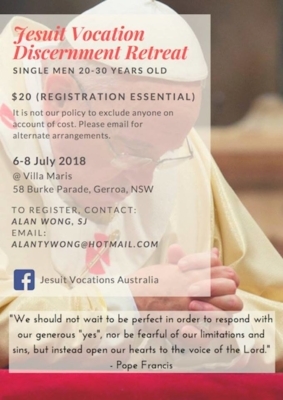 Jesuit Vocations Ministry in Australia is offering a weekend retreat for single men, 20-30 years old, who are discerning a vocation to the priesthood or religious life. The retreat will be held in Gerroa from 6-8 July 2018, beginning at 6pm. The retreat will consist of talks, guided meditations on the gospels, time for silent prayer and reflection, group and individual conversations, as well as, the celebration of the Sacraments of Reconciliation and the Eucharist. There is a meagre cost of AU$20 for the whole weekend which will cover all meals and accommodation. However, our ministry maintains a policy of not excluding anyone who might be unable to afford the cost but is interested in taking part in the programme.